If you want an effective — though unbelievably time-consuming — way to ward off would-be burglars, a 6'10" paper model of Samus Aran would probably do the trick. Flickr user IAmThatOneGuy (via Nintendo-Gamer) decided to recreate Samus in her Varia Suit from Metroid Prime 2: Echoes out of just paper. As the papercraft is based on the bounty hunter's actual in-game polygon model, it's as close as you can get to a real life Samus standing in your home. Hats off to you, IAmThatOneGuy. I give that man my respect. Too bad it's the Varia suit and not the Gravity suit. It will not do well under water. Paper Suit. Protects against nothing and very light weight, as if you were wearing nothing. Lady Gaga wears many kinds of materials, and she could probably wear this to her next concert/music video. The Paper Suit makes you jump high and you can use the wind to travel to distant places... and it scares off burglars. He is that one guy to make such an ambitious papercraft. that is amazing! props to him! Nobody here here heard of Cosplay? I'm doing the same thing on Alphonse Elric's armor to wear to cons. Wow, that's awesome. It must have taken a lot of hard work to do. @jordandrako: I'm sure most of us have heard of Cosplay but what has it to do with this? 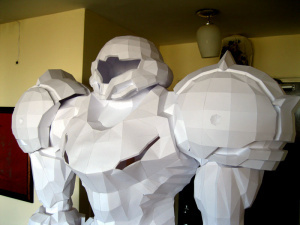 It's a paper Samus, you can't wear it. @RedBlueSpot If it were the varia suit model from Metroid Prime, I would say that it looks exactly like the gravity suit. That's not the case here though. Metroid Prime 2: Echoes had the even cooler gravity boost attachment for the dark suit. That's awesome. The best thing about this paper Samus, though, is that it won't uncharacteristically freak out over Ridley, it won't fawn over Adam with stupid and dull monologues voiced by a mediocre actress, and it won't all around destroy the Metroid I love. This paper Samus has a better personality than the piece of sludge personality given to her by Yoshio, for Other M.
I'm sorry for not being temperate. Rude of me. All round, this is a great statue! The level of epicness in that is absurd!